Snow. Darkness falls. Snow. Darkness falls. If you’ve read Kate Atkinson’s Life After Life, those words probably make you think of dead kids, and you probably agree with me that Edwardian England was in sore need of a DFACS. The book’s heroine, Ursula, is killed and reborn several times while she’s an adolescent. Whoo-wee there’s some negligent parenting going on here! And when Ursula finally makes it to womanhood, that’s when the sexual assault and spousal abuse begins. Sound brutal? 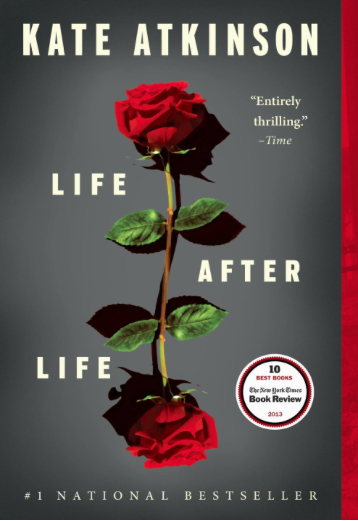 Atkinson’s novel about reincarnation, fate, chance, and redemption often is brutal. And also fascinating. It’s a piece of onyx carved by a mad, ingenious sculptor. Turn the carved stone over and over—new facets catch the light, jagged razor-sharp edges leave impressions on your palms. This is what the book was like for me, as Atkinson continuously cycles through the milestones of Ursula life (and of England’s history from WWI through WWII). Occasionally I worried that this series of revisited/revised scenes would get monotonous. Each time I got to that point, Atkinson would deftly hew the script into some new bend of her labyrinth. With each life, Ursula becomes wiser and more aware of he situation (if always just nebulously), and she evolves into a Valkyrie who—in the name of love—is ready to obliterate the whole of our world history and start the second half of the 20th century from scratch. When the novel ends (the cycle of Samsara doesn’t), Ursula is more like Franka Potente in Run Lola Run than Gwyneth Paltrow in Sliding Doors. Stylistically, Atkinson strays far from standard writing format. She doesn’t use commas when she’s technically supposed to. She layers flashbacks over flashbacks over flashbacks, and loves to use asides nested in parentheses. (“Don’t use parentheses,” Strunk & White would say.) The plot often bleeds into cluster of two or three scenes striated together, which actually fits quite nicely with the central idea of the book. In Life After Life, time is not linear. It’s an onion. It’s a Moebius strip, a flat circle. (Cue Matthew McConaughey and a beer-can doll). Highly recommended. The end. Darkness falls.